Kids love to doodle, be it with markers, crayons, finger paints, even food. That’s why the 3Doodler seemed like the perfect kids’ toy — except the heat needed to melt the 3D printing filament meant it was adults only. So the company has created a new version, designed specifically for kids, with new filament that melts with hardly any heat. 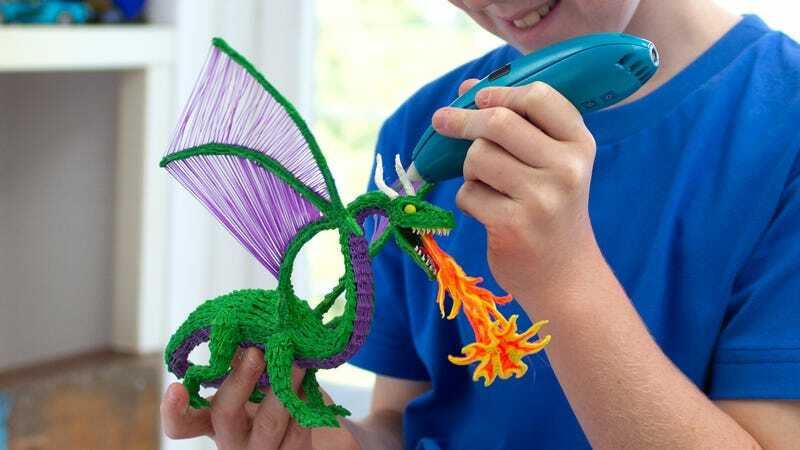 The 3Doodler Start works almost exactly like the original 3Doodler does, but the controls and functionality have been simplified for kids aged eight to thirteen. Pressing the pen’s single button once starts the plastic 3D printing filament extruding, and pressing it again stops the flow. A double-click of the button will reverse the flow, but that’s as complicated as the controls get. 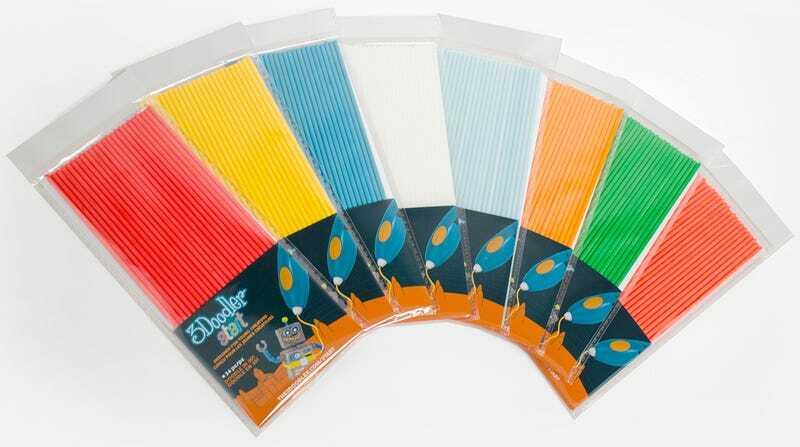 It only takes the 3Doodler Start about 30 to 40 seconds to warm up enough to actually start extruding filament. To make it safe enough for kids to use, none of the external parts get hot to the touch. You can even grab the white extruding tip when the 3Doodler Start is all warmed up, without the risk of even the slightest discomfort — let alone a burn. The 3D printing pen’s built-in rechargeable battery can be used for about 45 minutes to an hour before it needs to be topped off again, but you can plug it into a computer’s USB port, or a wall adapter, and keep using the 3Doodler Start while it charges. The other innovation that makes the 3Doodler Start safer for kids to use is a brand new eco-friendly plastic filament developed by WobbleWorks, the company behind the product, that melts at lower temperatures but becomes rigid again once it cools. Unlike the goop coming out of a hot glue gun, it won’t scorch skin if kids accidentally touch it while it’s being extruded. The new filament is also completely biodegradable, so if a 3D creation doesn’t quite turn out as a child envisioned it, they can just toss it in a compost bin alongside banana peels and veggie scraps and it will simply rot away. The 3Doodler Start won’t be available until May, but it’s now available for pre-order on the 3Doodler website. The starter kit, which includes the pen and two packs of filament, sells for $40 (£27.60), while a more elaborate $80 (£55.20) “Super Mega Pack” bumps that to eight packs of filament, silicone moulds that make it easier to get a creation started, and a project book full of inspiration.